Born in Bere Alston, Langman began his career with Tavistock, where he played alongside brother Peter. He joined the elder Langman at Home Park in 1953 and made quite an impact, scoring twice on his debut later that season, and ending up with nine goals in nine appearances by the end of the campaign. Despite twice finishing as the club's top scorer and grabbing four hat-tricks over his five years at Home Park, he was unable to make the centre-forward position his own. His final game for Argyle was also the last game that his brother played for the club. Neil moved on to Colchester United in 1957, where he scored 50 goals in 128 games before ending his career with spells at Bath City, Barnstaple Town, Falmouth and St Austell. Neil Langman is one of a reasonably small number of players to have gained representative honours while on Argyle's books. Being a home grown hero and registering a goal to his name on that occasion make him especially noteworthy. 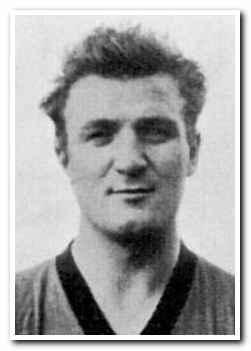 Neil was selected in the Third Division South side which lost 1-2 to the Third Division North side in April 1957 - this followed his success in the 1956-57 season when he scored 17 goals in 32 games for Argyle. I came across this information while researching Wilf Carter who was selected to play in the same fixture the following season. Thanks to Steve Dean's enquiries it emerged that Wilf did not actually play in that match - he was injured. I missed seeing Neil play for Argyle but I saw him, and got his autograph, when he returned to Home Park with Colchester in February 1959. His appearance, and Argyle's promotion form of course, helped to produce a crowd of 22,000. Honours were even in the 1-1 draw.